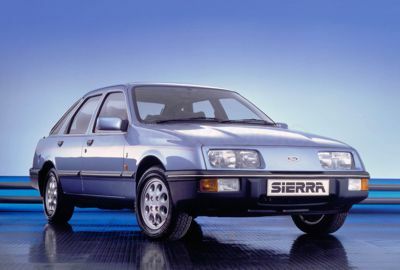 The Ford Sierra is a large family car that was built by Ford Europe from 1982 until 1993. It was designed by Uwe Bahnsen, Robert Lutzand Patrick le Quément. The code used during development was “Project Toni”. First unveiled on 22 September 1982 and with sales beginning on 15 October 1982, it replaced the Ford Cortina. Its aerodynamic styling was ahead of its time and as such, many conservative buyers (including company car drivers) did not take fondly to the Ford Cortina’s replacement. It was mainly manufactured in Germany, Belgium, and the United Kingdom, although Sierras were also assembled in Argentina, Venezuela, South Africa and New Zealand. The Sierra was the 1983 Semperit Irish Car of the Year in Ireland.